On July 9, North Delta CARES sent a letter to the Board of Directors of the Metropolitan Water District of Southern California, requesting that the Board rescind its vote to fund the California Waterfix. The text of the letter follows. We appreciate this opportunity to present some concerns we have about the California Water Fix as well as some possible alternative approaches to meeting the water needs of Southern Californians that we would like to have considered prior to the July 10 Board vote regarding potential funding of the California Water Fix. We believe these concerns are serious enough that they warrant a 60-day delay in the voting in order to have them adequately researched and considered prior to taking a final vote. There are many known gas wells and fields in the Delta Region as shown on the attached DWR-212, Figure 13-1. These gas fields and gas wells pose serious threats with the potential for major accidents and have been largely ignored, with minimal reference and mitigation measures in the California Water Fix. This is a serious omission and/or oversight on the part of DWR. This absence of proper consideration puts MWD and the State Water Agency at extreme liability for gas well accidents and resulting potential financial hardship to their water districts and customers. 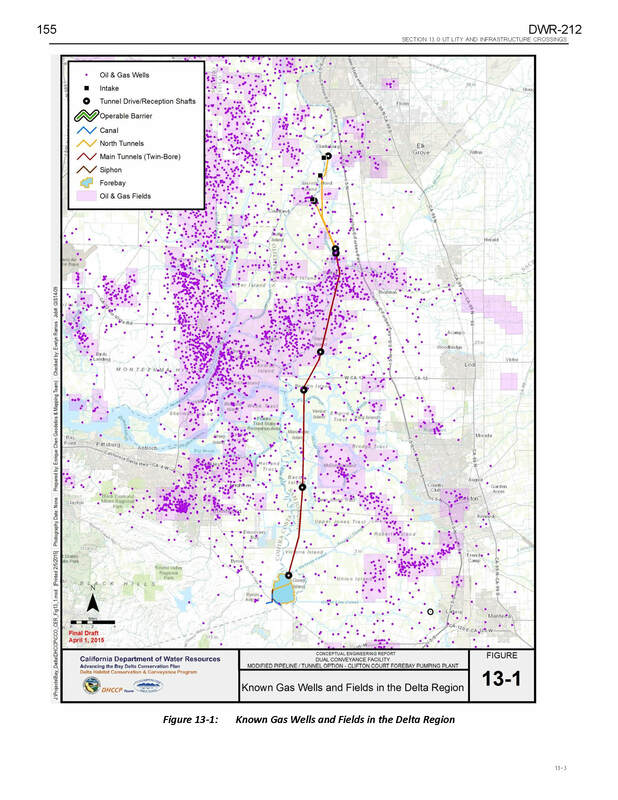 According to a 2010 review by outside engineering reviewers, DWR has neither designed nor constructed a project that passes through a gas field or near existing gas wells, either active or abandoned. Any mishap could cost MWD tens of millions of dollars of liability in resulting court cases in the event of one or more accidents involving gas wells or fields. On Friday, July 6, 2018, SWRCB staff proposed sweeping changes in the allocation of California’s water, leaving more water in Northern California’s major rivers to help ailing fish populations and giving less to farming and human consumption. This could have a major impact on the amount of water that water users from Metropolitan Water District of Southern California may have access to in future years. This could also significantly impact the amount of water which would be available to divert through the California Water Fix tunnels, possibly making the current tunnel plans obsolete. Of course, rain water capture, recycling and water conservation top the list; and more information can be found on the alternatives listed above using the links below. Thank you for researching the above issues to address these concerns and considering delaying your vote to a later date.